Made from koskin leather-look material, with calculator and gun metal badge and external pocket. Features include zippered closure, internal gusseted pocket, internal zippered pocket, 2 pen loops, business card holders, solar powered calculator, gun metal badge, zipper closure and A4 size lined pad which inserts from the top. Pens not included. Engrave silver. 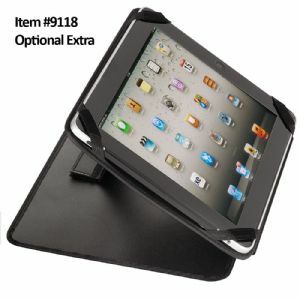 Fits an iPad in the front pocket/left side pocket. Laser – On Badge: 35mm(h) x 6mm(w). Screen – On Front: 150mm(w) x 120mm(h). Other Methods: Contact us for applicability and size.